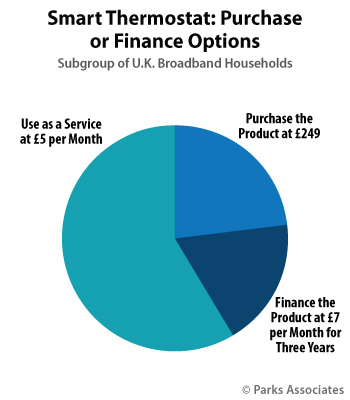 New research from Parks Associates finds strong interest in the U.K. for hardware-as-a-service options for smart thermostats, with 58% of broadband households willing to pay five pounds per month for a hardware and service bundle. Parks Associates will host the 13th-annual CONNECTIONS™ Europe: Strategies for Smart Home and Consumer IoT on 13-14 November at the Amsterdam Marriott Hotel to discuss strategies that leverage this interest in order to expand smart home adoption throughout Europe. CONNECTIONS™ Europe features keynotes from IBM, Inwido, Bosch Smart Home, Orange, and Philips and multiple sessions with research and executive insights on the business opportunities, revenue strategies, and partnership opportunities for the smart home, security, energy management, and wellness industries. Two key sessions at CONNECTIONS™ Europe focus on business models for energy and smart home products, new solutions in connected healthcare, and strategies to integrate these offerings within the larger smart home ecosystem. Sponsors include Homematic IP, Alarm.com, ASSA ABLOY, Bitdefender, F-Secure, Intamac, Open Connectivity Foundation, ROC-Connect, Trusource Labs, Z-Wave, Zigbee Alliance, and Mersoft.